Trimnells House has run for several successfully years as a B&B. ( Check us out on Tripadvisor.) 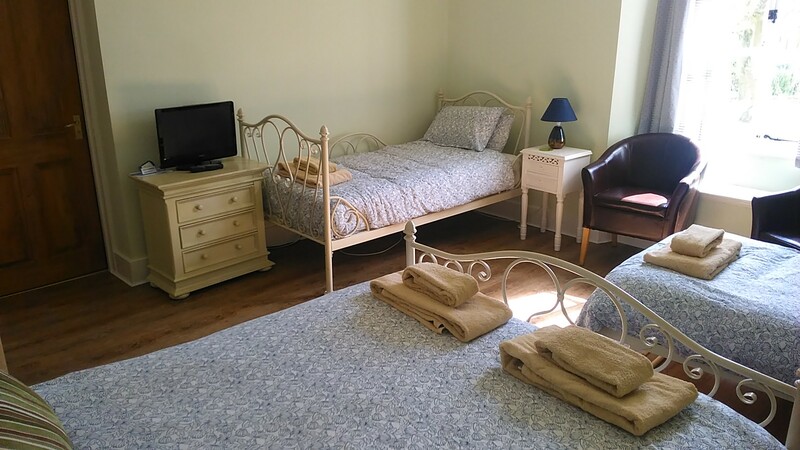 We found our guests were often impressed by the house, village and gardens but did not have the time to make use of them so we have moved into guest accommodation so that our guests can make full use of these facilities. Many of our guests wanted to enjoy village life for a longer period. “Make it so” we said! Our village offers guests a slice of village life including accommodating pubs where you will be welcomed, a village shop, a peaceful lifestyle, a smile in the street, and all a stones throw from Bath with all its attractions. You may wish to contact them to discuss what you need including takeaway or eat in food. The Fox and Hounds have a back room that was used by a hen party complete with a male entertainer! Trimnells offers large rooms (~20-30 sq mtrs) with en suites. Large off street car park. A quiet, safe location away from main roads but not far from major airports and the M4. Bath is a 20-30 minute drive to the center. We offer disabled facilities including a ground floor bedroom with level access shower. There is also a stair-lift to the first floor. Which might also be useful for those who have been to the pub. The accommodation is on the ground and first floor. The side annex and top floor are separate from the rest of the house. This picture is of the famously lovely village of Castle Combe nearby. Whilst the delights of Bath are close at hand, the village of Colerne itself offers many local amenities including a hairdressers, newsagent, florist, grocery store and two traditional village pubs providing great food and drink with the occasional music event , all reached within a five to ten minute walk from the house. There are also two clubs that often have live music or discos at the weekend. A short drive away, the picturesque villages of Castle Combe and Lacock and the local towns of Bradford-On-Avon and Corsham can be of great interest and provide many and varied dining opportunities. Lacock is a village bequeathed to the National Trust and used for scenes in Cranford and the Harry Potter movies as well as being the site of Lacock Abbey and Museum where Henry Fox Talbot did pioneering work on photography. Castle Combe has been described as the “the prettiest village in England” by many and was used in the film Warhorse. Locally many film and TV locations can be found. (See local activities for a list). For the summer we have a barbecue, ice maker and a large drinks chiller. We also have a games table, trampoline and fish pond which can be of interest to children. There is also a children’s play area in the village. (See local activities above for children’s interests). 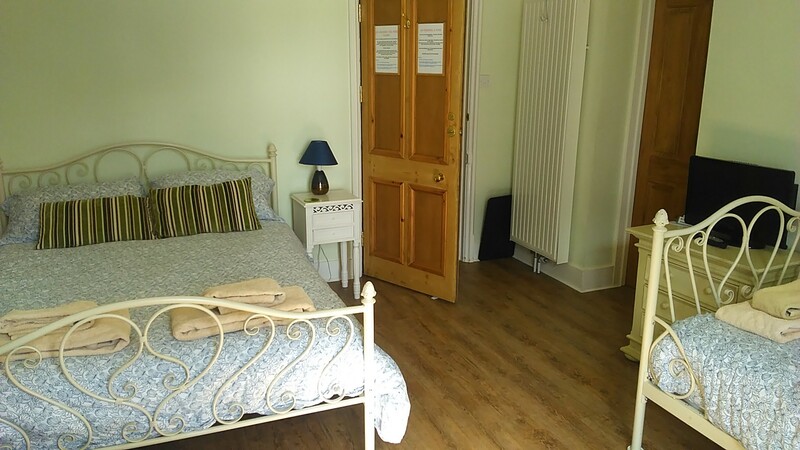 We have large rooms, gardens and an off street parking area all away from main roads. Located in a quiet village cul de sac, Trimnells House is set in nearly an acre of mature lawns and gardens including an ornamental pond. Seating is provided and guests are welcome to relax and enjoy the peace and tranquillity. Our own private car park allows us to offer ample off road parking for all our visitors. Guests are welcome to leave their vehicles at the house for the duration of their stay. The local bus provides a regular and reliable daytime service to and from Bath. All our guest bedrooms are generously sized and have their own en suite facilities. Each is equipped with a 22” digital LCD ‘Freeview’ TV including an integral DVD player, tea and coffee making facilities (fresh milk on request), hair dryer and clock/radio alarm. Key operated room safes are available for use. Please visit individual room pages for further information. We welcome well behaved children of all ages and our spacious and versatile rooms are ideal for family occupancy. We also provide cots (including bedding), high chairs and optional child safe window locks. 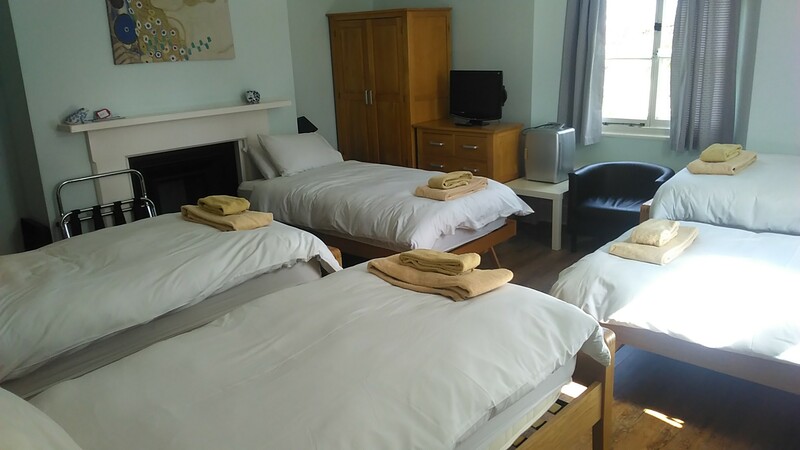 Some of our less able guests may benefit from the ground floor bedroom with its level access shower; a modern curved and continuous stair lift is also available to the guest bedrooms on the first floor. All our guests have use of the lounge during their stay which includes a 40″ LCD ‘Freeview’ TV and DVD player. There is a Wii games machine and a games table. Both the lounge and adjoining breakfast room are contemporary furnished and decorated to enhance the period features they retain. Complimentary Internet access via a secure Wi Fi connection is offered to guests with their own IT equipment. This is available throughout the house and many parts of the garden as well! We are happy to offer our guests complimentary additional towels for pool, sports or beach use away from Trimnells House. Just let us know your requirements and we will do our best to oblige. Environmental issues are important to us. Please feel free to leave us your paper, cardboard, glass, plastic and cans and we will ensure they are recycled. On request, a separate recycle bin can be provided for your room. Attention cyclists! Wash down facilities are available for your bikes along with a drying room for your kit. Walkers and ramblers are very welcome and there are many varied and picturesque routes to be explored locally. A boot room with a clothes airer is free to use. *Packed lunches are available with prior arrangement. All guests may wish to take advantage of our *laundry facilities; use of the washing machine, tumble dryer, clothes line and drying room are offered subject to availability. *Please note there will be an additional charge for these services. The above picture is a view of a room in nearby Lacock Abbey which was used as a ‘Harry Potter’ location. Trimnells House is in a very beautiful, interesting and historic corner of England, with many cultural sporting and gastronomic opportunities close by. It makes a splendid base for exploring Bath, the Cotswolds, the West Country and Salisbury Plain. Here are some selected links to fire your imagination. A good sized ground floor double room with level access to the breakfast room and guest lounge. The room has a King size bed including a 1500 pocket sprung mattress with memory foam. 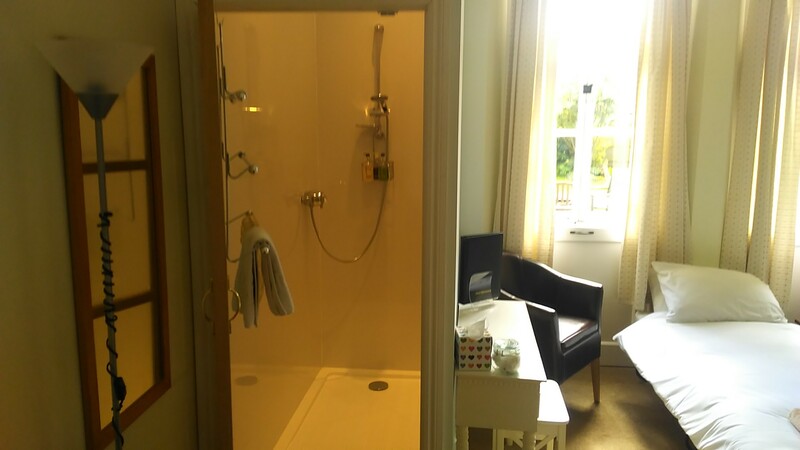 This room offers en suite facilities including a level access shower and separate toilet/wash hand basin cubicle with illuminated vanity mirror and shaver socket. The room is equipped with 22” digital LCD ‘Freeview’ TV including an integral DVD player. The TV is recessed in the illuminated original stone fireplace and framed by a substantial Victorian mantle piece. Tea and coffee making facilities are also available along with a hair dryer and radio/alarm clock. The original sash window shutters are still in place and fully functioning. An unusual and charming room offering views onto the front garden. Good for those with decreased mobility. A full English breakfast and Wi Fi access are included in the price. An additional bed can be added to this room to make a twin for holiday let purposes. A cot can also be added. A generously sized first floor room with double aspect views of the rear and side gardens including the ornamental pond. This room has a 6’ super king sized zip and link bed and a 3’ single bed both including a 1500 pocket sprung mattress with memory foam. The 6’ bed can be converted into two 3’ singles thus allowing double/twin or triple occupancy of the room. Room 2 laid out as 4 singles. This room offers en suite facilities including a cubicle shower, toilet and wash hand basin with illuminated vanity mirror, heated towel rail and shaver socket. The room is equipped with 22” digital LCD ‘Freeview’ TV including an integral DVD player. Tea and coffee making facilities are also available along with a hair dryer and radio/alarm clock. Original features include a Victorian fire place and window seats. A bright, airy and versatile room with charming views. A full English breakfast and Wi Fi access are included in the price. This room can be booked as a 1-4 singles or as a doublr and 1-2 singles if booked via our website or phone. Cots available. Our largest and most adaptable room located on the first floor with double aspect views of the front and side gardens. This room has a king sized zip and link double bed and a 3’ single bed both including a 1500 pocket sprung mattress with memory foam. Another two 3’ beds are also available if required for family occupancy. This room has spacious adjoining en suite facilities, including a walk in shower, toilet and wash hand basin with illuminated vanity mirror, heated towel rail, shaver socket and its own view over the front garden! Room 3 laid out as 5 singles. Can be laid out as a zip and link double and 1-3 singles. Trundle beds are stored under existing beds. A large, light, and versatile room with a stunning en suite. A full English breakfast and Wi Fi Internet access are included in the price. A large and distinctive double or family room located on the first floor overlooking the front garden. 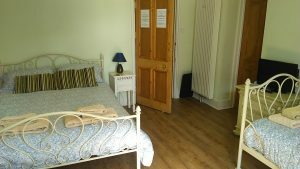 This room has a 5’ king sized double bed and a 3’ single bed both including a 1500 pocket sprung mattress with memory foam. Another 3’ bed is also available if required for family occupancy. 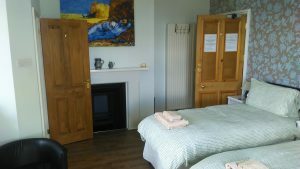 This room has spacious adjoining en suite facilities, including a walk in shower, toilet and wash hand basin with illuminated vanity mirror, heated towel rail and shaver socket. 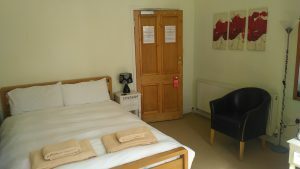 The room is equipped with a 22” digital LCD ‘Freeview’ TV including an integral DVD player. Tea and coffee making facilities are also available along with a hair dryer and radio/alarm clock. 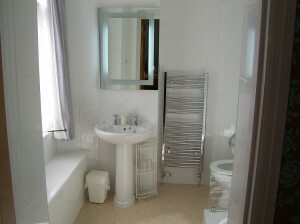 A bright and versatile room with a generously sized en suite. 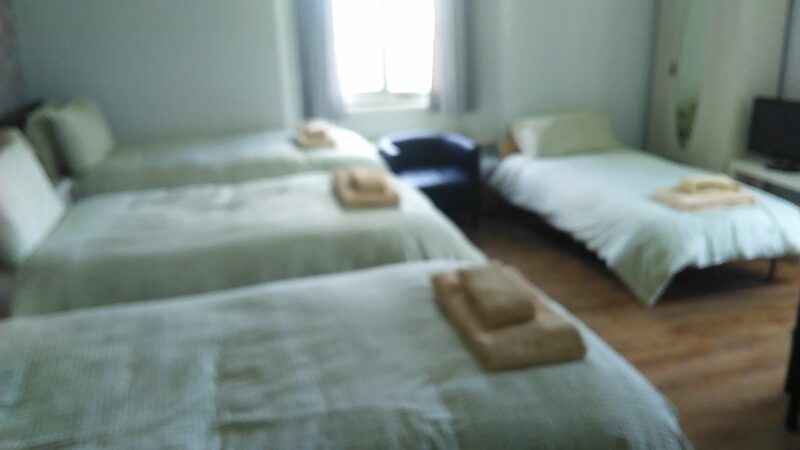 This room can be booked as a 1-3 singles or as a double and 1-2 singles if booked via our website or phone. Cots available.